Home > Cruise Shore Excursions > Montego Bay Pier > Green Grotto Caves From Montego Bay Cruise Pier. The Green Grotto Cave is situated on the beautiful North Coast of Jamaica, the Green Grotto Caves are located between the resort centers of Ocho Rios and Montego Bay. The central feature of this natural attraction is the large labyrinthine limestone caves with its numerous rock formations, its stalactites, stalagmites and abundance of overhead ceiling pockets makes the Green Grotto Caves a must see. Green Grotto Cave is 1,525 meters long and 12 meters deep and is characterized by numerous chambers, light holes and a subterranean lake. 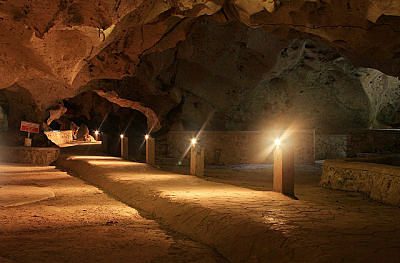 The Green Grotto Cave is rich in history and the first Jamaicans, the Arawak Indians (Tainos) found shelter in the caves during our English rule. In the mid 20th Century, between the two world wars, they were used by smugglers running arms to Cuba. In the latter years during the Second World War, the Government of Jamaica used the entrance of the cave as a storeroom for rum in barrels. This enchanted and historical Jamaica experience is a must see while in Jamaica. Since that time the Green Grotto Caves has been transformed into a world class attraction winning Green Globe 21 Certification since 2003 and in 2009 achieving platinum-status certification. We had a great and interesting experience visiting the Grotto caves, very informative ride from the pier, driver was very friendly, the tour was great, we got refreshments, gears, the guide told us about the history of the caves which we found very interesting. We had a great time and would recommend this tour. Ask a question about the Green Grotto Caves From Montego Bay Cruise Pier.